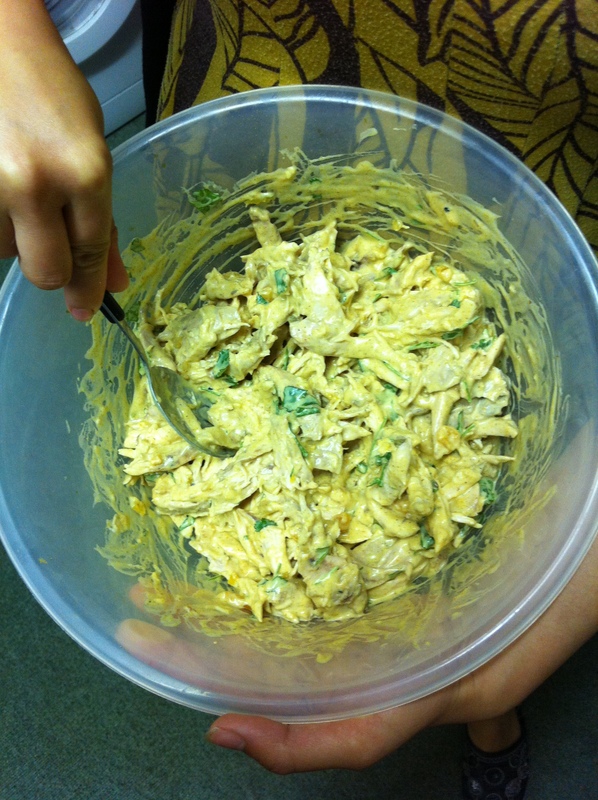 CORONATION CHICKEN | YUM YUM PIGGY'S BUM...! Hope everyone enjoyed watching Prince William getting married to Kate Middleton, a wonderful royal and stylish spectacle and a great representation of British culture and tradition. Makes a change from watching the news where so many awful events have featured recently such as the tsunami in Japan, the bombing in Morroco and problems in the Middle East. At least, today felt like Britain was united in cheering on the newly wedded couple. Just felt like there was a glimmer of hope in this cruel world. Luckily yesterday was a holiday for me and many others due to the royal wedding, couldn’t help but notice how quiet the streets and shopping centres were as many were watching the wedding. 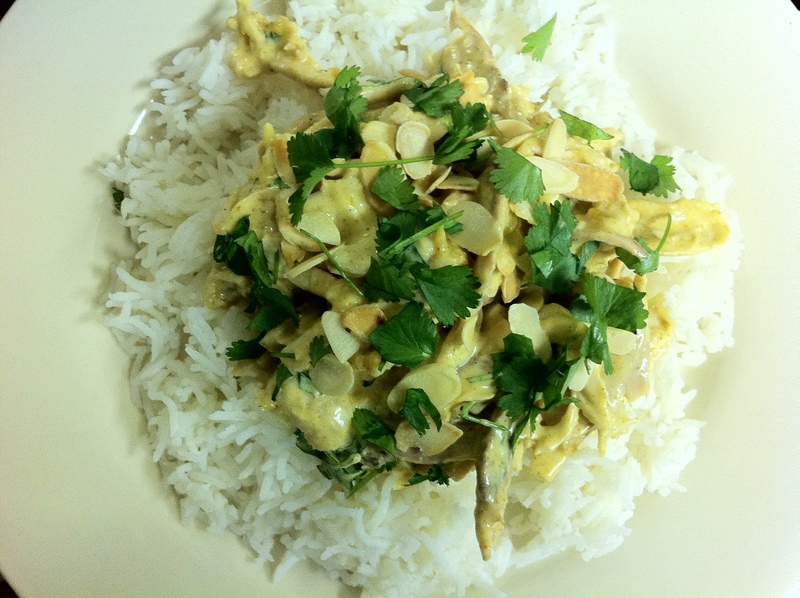 As I had a number of hours to spare today, thought I should cook coronation chicken. This is a old dish which was produced for the coronation of Queen Elizabeth II and contains cold chicken pieces mixed with spices and mayonnaise. Not really tried alot of coronation chicken as was put off slightly by the high amount of mayonnaise and gooeyness in a sandwich bought for me on my first day at work by an ex-boss about six years ago. So was inspired and intrigued by Felicity Cloake who writes a food column for the Guardian newspaper. She published a recipe the other day claiming she had produced “perfect coronation chicken”. She’s superb because she does alot of the hard work in testing out a number of recipes for a particular dish and then kind of picks out the best aspects to produce what she thinks is the perfect recipe. One day, she should think about publishing a book full of her perfect recipes as I’m sure she has alot of fans! Poaching is one of my favourite ways to cook chicken and reminds me of the way alot of Chinese people cook “white-cut chicken” where they gently cook a whole chicken in simmering water which usually has spring onion and ginger added to it. The chicken is then chopped into pieces and often served up on special occasions such as New Year. Chicken cooked this way means that it is the star of the show where you can taste the subtle flavour of the chicken and the texture of the meat is silky smooth and tender. I followed most of Felicity’s recipe except for a few things. I decreased the simmering time to 30 min and turned the chicken once during this cooking time. Then I turned off the heat and left the chicken in the water for 1 hour. This is the way my mother cooks her chicken so as not to overcook it. I didn’t have any saffron so had to leave that out and the brand of curry powder I tried was by Schwartz. I was so glad to have followed Felicity’s version but couldn’t wait for the chicken to chill for a couple of hours before eating it. Me and my boyfriend just chomped our way through. I asked him whether it tasted the same as the ones in the supermarket. He declared “Well you know, supermarket ones have raisins in them and are a far brighter yellow but this tastes f*** loads better!” Even though he was full, he just couldn’t stop picking up more chicken pieces out of the bowl to scoff! I was glad that the sauce wasn’t just mayonnaise, the yoghurt does lighten it and I could taste the spices and ginger coming through. It was a very moreish dish and extremely good for picnics and outdoor eating such as when you’re having a barbeque. I would leave the chilled chicken mixture at room temperature for at least 30 min before serving just to take the chill off. This is a recipe which was easy and well worth trying out especially as summer is almost here. Put the chicken breast-side up in a large pan and add the cinnamon, peppercorns, bay leaf and salt. Chop the ginger in half and cut one of the half pieces into slices a few millimetres thick. Pop these slices into the pot. Add cold water until this just covers the chicken and heat the water until boiling. Turn the heat down and put the lid on the pot and make sure the water is gently simmering. Simmer for 30 min and turn the chicken once. (I used a pair of chopsticks to do this by sticking one each into the sides of the chicken and carefully rotated it). At this point, I also stabbed a couple of holes into the thick parts of the chicken such as the thighs to help ensure these areas get cooked. After simmering, turn off the heat and leave the chicken in the water for 1 hour. 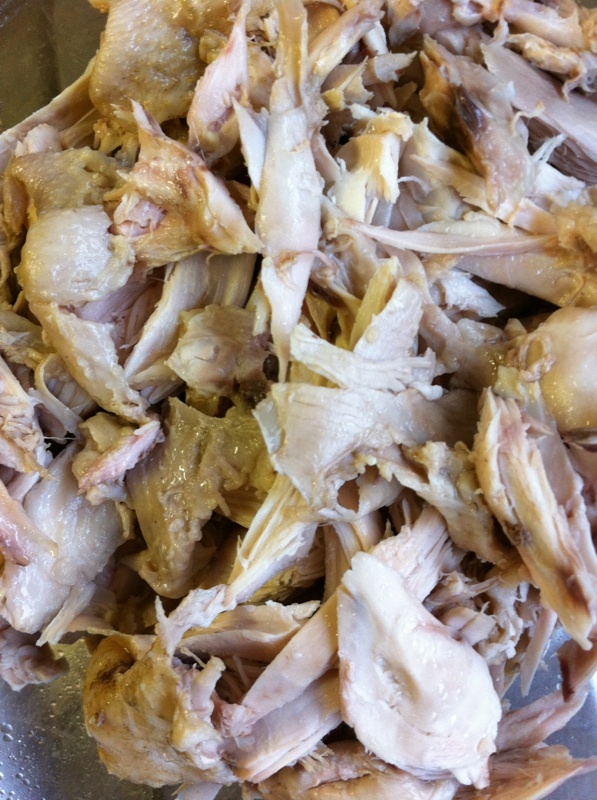 Then take chicken out, drain out the water from the chicken cavity and leave in a bowl to cool down. Shred the chicken into small pieces, it’s optional if you want to keep the skin or not. Slice the skin off the remaining piece of ginger and chop finely. Toast the almond flakes in a dry frying pan for a few minutes. Watch carefully as these can easily burn. Put the almond flakes aside in a bowl. Put the mango chutney and chopped apricots into a big bowl. Dry-fry the curry powder in a frying pan for about 2 min. You should be able to smell the aroma of the spices by now. Add the curry powder to the bowl. Then add Worcestershire sauce, ginger, mayonnaise and yoghurt. Season with salt and pepper. Mix and taste, adjust seasoning if required. When the chicken is cold, add the chicken pieces to the sauce and mix so that each piece is thoroughly coated. Leave the chicken mixture in the fridge for a few hours. Then add chopped coriander and mix this in. Sprinkle toasted almonds and coriander leaves on top. Serve with rice and salad.